Thisstory was updated at 4:44 p.m. ET. Two Russiancosmonauts took a spacewalk outside the International Space Station Thursday tostart up a new docking port on the roof of the orbiting lab. 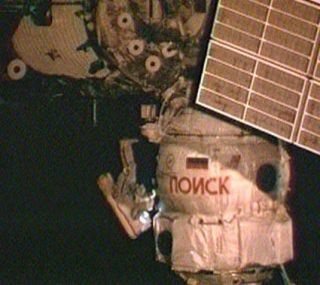 CosmonautsOleg Kotov and Maxim Suraev floated outside the station at 5:05 a.m. EST (1005GMT) and spent almost six hours hooking up cables, antennas and other gear toactivate the station?s new Poiskdocking port. RussianMission Control asked the cosmonauts how the weather was in space as they begantheir work. ?As long asit doesn?t rain, we?ll be fine because we didn?t take any umbrellas with us,? Suraevjoked in Russian. ?I was hoping to get a suntan.? The 5-hour,44-minute spacewalk was the third for Kotov, a veteran cosmonaut, and the firstfor Suraev, who marveled at space after leaving the station while flying 210miles (337 km) above the southern Pacific Ocean. ?It looksgreat, although it?s still pretty dark,? he said. ?Wow, am I really out?? Also knownas the Mini-Research Module 2, the Poisk module is a small science room thatarrived at the space station in November 2009 to serve as research space. Itdoubles as an airlock and docking port, adding an extra parking spot forRussian-built Soyuz and Progress spacecraft. That extraparking is vital for the spacestation to support full, six-person crews, which require at least two Soyuzferry ships docked at all times to serve as lifeboats in emergencies. UnmannedProgress cargo ships typically take up a third spot, and a fourth docking portat the front of the station is built to host visiting NASA space shuttles. WithPoisk, the station has five docking ports in all. Spacestation astronauts plan to dock a spacecraft at Poisk, which means ?Explore? inRussian, for the first time on Jan. 21, when they move their Soyuz vehicle froma different port, mission managers said. The Poiskmodule is about 13 feet (4 meters) long, 8 feet (2.5 meters) wide and weighsabout 8,000 pounds (3,628 kg). It has about 380 cubic feet (10.7 cubic meters)of usable living space inside. Thursday?sspacewalk was the 24th Russian spacewalk outside the space station and the137th excursion overall dedicated to the orbiting laboratory?s construction andmaintenance. Kotov andSuraev tossed two big wads of space trash ? unneeded insulation covers ?overboard during the spacewalk. The trash is expected to burn up in the Earth?satmosphere in about two weeks. They also retrieved a Russian biology experimentfrom the outer hull of the space station. The $100billion space station has been underconstruction for more than a decade and is due to be completed later thisyear. The space station is home to five spaceflyers ? two Russians, twoAmericans and one Japanese astronaut. With threespacewalks now under his belt, Kotov ended the day with 16 hours and 46 minutesof orbital work. Suraev, meanwhile, has five hours and 44 minutes ofspacewalking time after one excursion. At times,the cosmonauts were well ahead of schedule and paused to take photos. ?You are asuperstar,? Suraev said as he took the snapshots of his crewmate. Thespacewalk came at a busy time for the space station crew. Earlier this week,the astronauts used the outpost?s robotic arm to move a huge spare parts shelffrom one end of the space station to the other to prepare for more deliverieslater this year. Next week,the astronauts will move one of their Soyuz spacecraft to the new Poisk dockingport, then gear up for the arrival of the spaceshuttle Endeavour in early February. Endeavouris due to launch six astronauts to the space station on Feb. 7 to deliver a newmodule and observation port for the orbiting laboratory.